The moa were large flightless birds. They lived only in New Zealand, and are now all extinct. There were eleven species (in six genera) of Moa. The largest and best known were the genus Dinornis, which grew up to 3.6 meters (12 feet) tall, and weighed as much as 230 kilograms (510 pounds). The group of birds to which the moa belong had been in existence since the Cretaceous period. The Māori people arrived in New Zealand from Oceania about a thousand years ago. Then, moas lived in large numbers, especially on South Island. Archaeological sites with evidence of moa hunting are all over New Zealand. The moas became extinct about five hundred years ago. The moas had survived being hunted by Haast's eagle. However, they could not survive being hunted for food by the Maoris. Recent extinctions (also mostly birds) have been caused by habitat change and introduced species. A restoration of Dinornis robustus and Pachyornis elephantopus, both from the South Island. The two main faunas identified in the South Island include: 1. The fauna of the high rainfall west coast beech (Nothofagus) forests that included Anomalopteryx didiformis (bush moa) and Dinornis robustus (South Island giant moa); and 2. The fauna of the dry rainshadow forest and shrublands east of the Southern Alps that included Pachyornis elephantopus (heavy-footed moa), Euryapteryx gravis, Emeus crassus and Dinornis robustus. The two other moa species that existed in the South Island; Pachyornis australis and Megalapteryx didinus might be included in a ‘subalpine fauna’, along with the widespread Dinornis robustus. 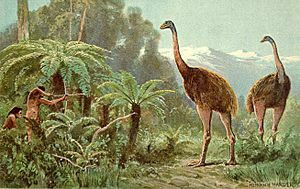 P. australis is the rarest of the moa species, and the only one not yet found in Maori middens. Its bones have been found in caves in the northwest Nelson and Karamea districts (such as Honeycomb Hill Cave), and some sites around the Wanaka district. M. didinus is more widespread. Its name "upland moa" reflects the fact its bones are commonly found in the subalpine zone. However, it also occurred down to sea level where there was suitable steep and rocky terrain (such as Punakaiki on the west coast and Central Otago). Their distributions in coastal areas have been rather unclear, but were present at least in several locations such as on Kaikoura, Otago Peninsula, and Karitane. The skeletons of Eastern moa (Emeus crassus) and other kinds of moas in Otago museum. Significantly less is known about North Island paleofaunas, due to a paucity of fossil sites compared to the South Island; however, the basic pattern of moa-habitat relationships was the same. Although the South Island and the North Island shared some moa species (Euryapteryx gravis, Anomalopteryx didiformis), most were exclusive to one island, reflecting divergence over several thousand years since lower sea level had resulted in a land bridge across Cook Strait. In the North Island, Dinornis novaezealandiae and Anomalopteryx didiformis dominated in high rainfall forest habitat; a similar pattern to the South Island. The other moa species present in the North Island (Euryapteryx gravis, E. curtus, and Pachyornis geranoides) tended to inhabit drier forest and shrubland habitats. P. geranoides occurred throughout the North Island, while the distributions of E. gravis and E. curtus were almost mutually exclusive, the former having only been found in coastal sites around the southern half of the North Island. Approximately eight moa trackways, with fossilised moa footprint impressions in fluvial silts have been found throughout the North Island, including Waikanae Creek (1872), Napier (1887), Manawatu River (1895), Marton (1896), Palmerston North (1911) (see photograph to left), Rangitikei River (1939), and underwater in Lake Taupo (1973). Analysis of the spacing of these tracks indicates walking speeds of between 3 and 5 km/h (1.75–3 mph). D. novaezealandiae skull at the Museum für Naturkunde, Berlin. Although feeding moa were never observed by scientists, their diet has been deduced from fossilised contents of their gizzards and coprolites, as well as indirectly through morphological analysis of skull and beak, and stable isotope analysis of their bones. Moa fed on a range of plant species and plant parts, including fibrous twigs and leaves taken from low trees and shrubs. The beak of Pachyornis elephantopus was analogous to a pair of secateurs, and was able to clip the fibrous leaves of New Zealand flax (Phormium tenax) and twigs up to at least 8 mm in diameter. Like many other birds, moa swallowed gizzard stones (gastroliths), which were retained in their muscular gizzards, providing a grinding action that allowed them to eat coarse plant material. These stones were commonly smooth, rounded quartz pebbles, but stones over 110 millimetres (4 in) in length have been found amongst preserved moa gizzard contents. Dinornis gizzards could often contain several kilograms of stones. It has been suggested that moas exercised a certain selectivity in the choice of gizzard stones and chose the hardest pebbles. Fragments of moa eggshell are often encountered in archaeological sites and sand dunes around the New Zealand coast. Thirty six whole moa eggs exist in museum collections and vary greatly in size (from 120–240 millimetres (4.7–9.4 in) in length and 91–178 millimetres (3.6–7.0 in) wide). The outer surface of moa eggshell is characterised by small slit-shaped pores. The eggs of most moa species were white, although those of the upland moa (Megalapteryx didinus) were blue-green. 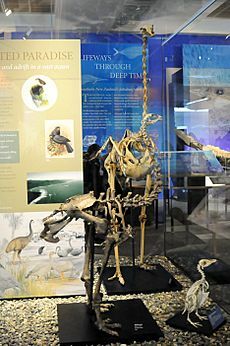 The skeleton of female upland moa with egg in unlaid position within the pelvic cavity in Otago Museum. An artist's rendition of a Haast's eagle attacking moa. Before the arrival of human settlers, the moa's only predator was the massive Haast's eagle. New Zealand had been isolated for 80 million years and had few predators prior to human arrival, meaning that not only were its ecosystems extremely fragile but the native species were ill-equipped to cope with human predators. The Māori arrived sometime before 1300, and all moa genera were soon driven to extinction by hunting and, to a lesser extent, by habitat reduction due to forest clearance. 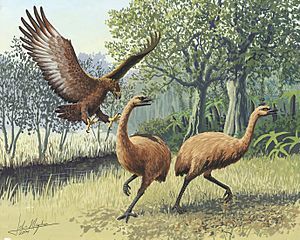 By 1445, all moa had become extinct, along with the Haast's eagle which had relied on them for food. Recent research using carbon-14 dating of middens strongly suggests that the events leading to extinction took less than a hundred years, rather than a period of exploitation lasting several hundred years, which is what had previously been hypothesized. Some authors have speculated that a few Megalapteryx didinus may have persisted in remote corners of New Zealand until the 18th and even 19th centuries, but this view is not widely accepted. Some Māori hunters claimed to be in pursuit of the moa as late as the 1770s; however, it is possible that these accounts did not refer to the hunting of actual birds as much as a now lost ritual among south islanders. Whalers and sealers recalled seeing monstrous birds along the coast of the South Island, and in the 1820s, a man named George Pauley made an unverified claim of seeing a moa in the Otago region of New Zealand. An expedition in the 1850s under Lieutenant A. Impey reported two emu-like birds on a hillside in the South Island; an 1861 story from the Nelson Examiner told of three-toed footprints measuring 36 centimetres (14 in) between Takaka and Riwaka that were found by a surveying party; and finally in 1878 the Otago Witness published an additional account from a farmer and his shepherd. 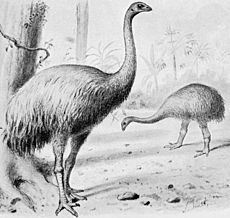 An 80-year-old woman, Alice Mckenzie, claimed in 1959 that she had seen a moa in Fiordland bush in 1887, and again on a Fiordland beach when she was 17 years old. She claimed that her brother had also seen a moa on another occasion. Sir Richard Owen holding the first discovered moa fossil and standing with a Dinornis skeleton, 1879. Palaeontologists working on moa bone deposits in the 'Graveyard', Honeycomb Hill Cave System. This cave is a closed scientific reserve. A preserved Megalapteryx foot, Natural History Museum. 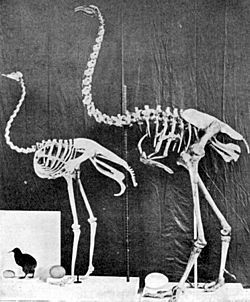 An early 20th century reconstruction of a moa hunt. Moa Facts for Kids. Kiddle Encyclopedia.